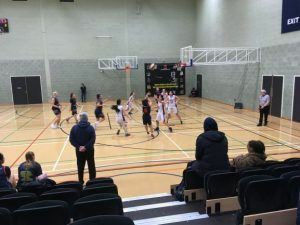 Team Sunderland Women’s Basketball 1sts hammered Durham 3rds on Wednesday, February 6 at City Space, Sunderland. The hosts dominated the league’s bottom side from the start and held leads of 29-6 after the first quarter, 43-10 at half-time and 60-19 after the third quarter. Sunderland then finished with a flourish, scoring a mammoth 38 points in the final quarter to wrap up a 98-28 demolition of the visitors, who remain winless this season. The result sees Sunderland stay in sixth place in the 10-team BUCS Northern 2B league but moves them onto nine points and within three points of York 1sts in 5th. It also greatly improves their points difference, something coach Harry Wood targeted before the match. Wood said: “The places will be sorted out by points difference so we needed to keep them under pressure all the time. “I had set them a target of 100 but we fell one basket short but that’s fine because it’s made our position in the league a lot more stable. “The game itself, it was quite interesting because we don’t very often get a chance to play what we call a full-court press. “I was trying to get the players to defend the opposition straight away in their end of the court. Looking ahead to the rest of the season, Wood added: “Our aim is to climb a couple of places in the middle of the division, possibly even get to third or fourth.